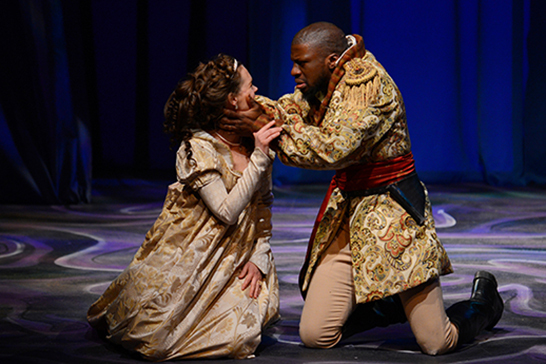 Michael Luwoye starred in Othello at UA in 2013. Hamilton—an unlikely pairing of hip hop and history—tells the story of founding father Alexander Hamilton and his transformation from an impoverished orphan in the Caribbean to the first U.S. Secretary of Treasury. The musical opened in 2015, and by the next year it had won 11 Tony Awards, a Grammy Award, and the 2016 Pulitzer Prize for Drama—not to mention selling out night after night after night. Luwoye will take the stage one night a week as the lead alternate for Alexander Hamilton—originally played by Lin-Manuel Miranda, the lyricist, composer, and author of the production. Though Hamilton marks Luwoye’s biggest theatrical breakthrough since he graduated from UA in 2013, it is not his only success. He also starred in Witness Uganda—later renamed Invisible Thread—which tells the story of a gay New Yorker who travels to Uganda to help build a village school and find his place in the world. Luwoye’s performance as the main Ugandan student garnered the attention of critics, and later he was nominated for the 2016 Lucille Lortel Award for outstanding lead actor. Miranda initially saw Luwoye in Invisible Thread, and, in a tweet hailed his “tremendous talent,” adding that he would make a wonderful Alexander Hamilton.